Do you want to go pazzo? Not sure what it means? Take a look at the fun video slot from JackpotCity and you’ll know exactly what we mean. You can go completely crazy with the 5-reel, 5-paylines video slot Crazy Chameleons. And what’s even crazier, is that there is another version of this game available in the form of a Golden Goose bonus, but more on that later. Crazy Chameleons has a maximum bet of 100 coins, with up to 5 000x your bet that can be won when 5 chameleons land on a winning payline. There is one Wild symbol, which is the waves breaking, and this symbol will substitute for all the other symbols to form winning combinations. Other symbols include the sun, a seagull, a pair of swimming shorts and a surf board. It’s the perfect game for a hot summer’s day and even though there’s not much to the game, there are enough winning opportunities. 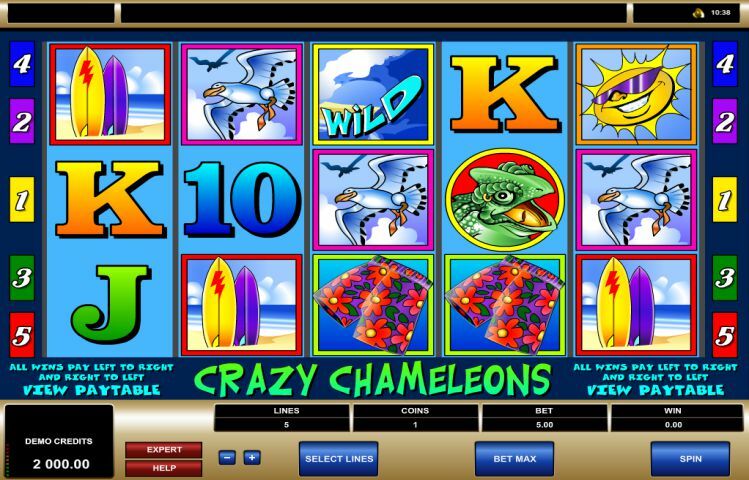 Enter Golden Goose Crazy Chameleons, which is an updated version of the 5-payline Crazy Chameleons Video Slot. The Golden Goose version has 20 paylines and, besides the Wild symbol, also has a Scatter symbol, which is the red chameleon. The rest of the symbols are all the same as per the regular game, except for the sunblock which has been added – clearly for a good reason as it can pay up to 600x your original bet. Select a playing card to reveal your Free Spins, after which the goose will lay a golden egg to reveal your Multiplier. You can win up to 11 Free Spins with an up to 6x Multiplier. Select a golden egg from each reel where you could win up to a 5 000 coins. Pick the cash to win up to 10 000 coins OR pick the egg where you could win up to 50 Free Spins with an up to 3x Multiplier. The Golden Goose will award you with a prize of up to 2 000 coins. Both Crazy Chameleons and Golden Goose Crazy Chameleons are fun games to play and can be found at JackpotCity Casino. Other games in the Golden Goose series include Genie’s Gems, Totem Treasure and Winning Wizards. As a new player at the casino, you will qualify for 4 x 100% match bonuses worth up to 400 credits each on your first four deposits. Join the glitz and glamour of JackpotCity Casino today and go completely crazy with more than 500 games to choose from, including Crazy Chameleons.